I think I know why you are on this page… A new Pinterest update 2019 just happened, some algorithm or interface changes seem to be occurring as we speak, and your traffic is either going down or up (lucky you if it’s the latter!). I created this page because I got tired of replying over and over to similar questions I receive from my students about the latest Pinterest update (s). I plan to update this page fairly frequently – as soon as something significant happens on Pinterest, you’ll be the first one to know about it from this post. So SAVE THIS PIN to your Pinterest Marketing board for later. 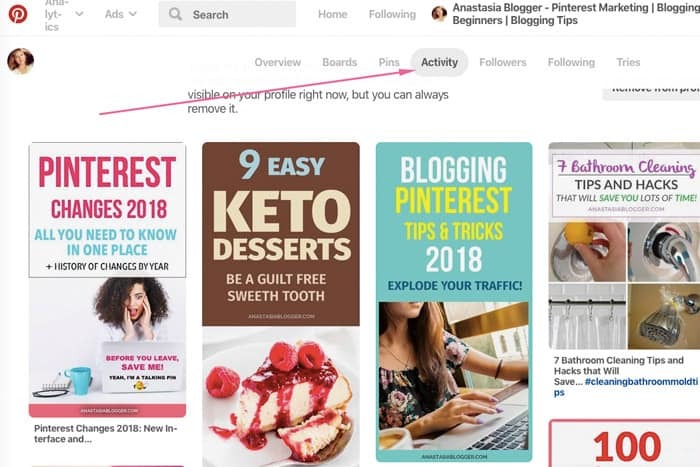 If you use Pinterest for marketing your products or you are a blogger and drive traffic from this platform, you probably know by now that algorithm updates and major interface changes happen on Pinterest so often that people are getting confused by what is the most recent or new update, what happened just a month ago. I want to make your life easy! Here, on this page, Pinterest updates are presented in chronological order and also are explained as per what is an actual change, what is a rumor, and how you should react to these changes. I’m going to also mention here some news related to the Pinterest-approved scheduler Tailwind and their new features as this might be directly related to your activity on Pinterest. 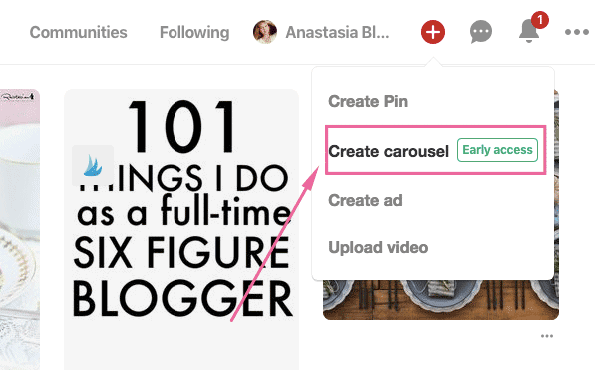 All business accounts on Pinterest can now create Carousel Pins – this is a new type of pins which allows up to 5 different images published as a slider under the same pin URL. These images can be linked to different page URLs on your website, they can also have different titles and descriptions! Pinterest initially introduced Carousel pins as an additional tool for businesses to make their ads more attractive. However, right now you can create Carousel pins without starting an ad campaign. Just go to your Pinterest account on a desktop and click on the “plus” button next to your profile name. From the drop-down, select Create Carousel. There is a chance that as early adopters of the new pin format, we could gain some additional benefits. First, at the beginning, not many users will create these Carousel pins (they obviously take more time than the regular pins). Plus, Pinterest should probably give an additional initial boost to the new pins so that more content creators get interested in saving these Carousel pins. 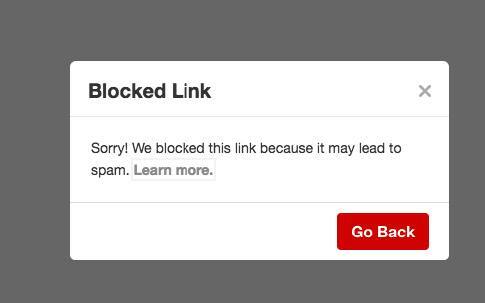 This day many bloggers and Pinterest marketers woke up to see their domains marked as spam on Pinterest. This very blog you are reading now was also blocked and you can’t imagine how I was worried about it – all my Pinterest traffic was gone for nearly 24 hours. As far as I was able to follow up the situation in multiple blogging communities on Facebook, the majority of the affected accounts were working fine within 24 hours since the issue was known about. Pinterest didn’t make any official statements, didn’t reply to anyone’s emails, just fixed the issue and pretended that nothing happened. In case you ever get caught by a similar issue in the future, here are a few tips on how you can try to help your domain get unmarked as soon as possible. When you write an email to them, no matter how pissed you are by the situation, make sure you use respectful language because after all, the person reading your message, is just a person. You don’t know how that person who is not personally responsible for the algorithms on Pinterest, might feel about your message, and how this could influence his or her decision about your account. Email creators-support @ pinterest.com – this address was shared by Pinterest on their conference for content creators. Visit the page https://help.pinterest.com/en/contact, select “Business Account” and then choose the option appropriate to your request. One more tip that might not be applicable to every situation, but I thought it’s worth mentioning this insider tip. You see, some companies have a privilege of talking to Pinterest reps directly and when a large-scale glitch is causing some trouble for bloggers or content creators, they do their best to help us. During the latest instances of mass accounts blocking, Tailwind (officially approved Pinterest scheduler), Mediavine and Adthrive (advertising network for bloggers) created lists of affected accounts in their FB communities and then sent lists to Pinterest to manually look into each blog. If you noticed that your Pinterest Analytics show nearly 0 views on some days in July 2018, that’s just a glitch and you can verify in your Google Analytics that you were getting traffic from Pinterest on those days normally. Tailwind made an announcement about their long-awaited SmartLoop tool. They promised to roll it out on all accounts within 8-12 weeks. If you are following Pinterest updates and changes closely, you probably noticed that 2018 is the year when Pinterest started really opening up a little more info to marketers, bloggers, content creators. Yes, Pinterest even organized the first-ever conference for content creators. Out of all the information that was presented to the blogging community lately, not all “news” truly new or part of a Pinterest update. They just never spoke so openly about the ways you should promote your content on their platform. However, a lot of stuff that was discussed during the conferences worked on Pinterest for years this way, and Pinterest just never spoke about it so openly. On this page, I do my best to separate what Pinterest reps claim, what Pinterest Best practices dictate, from what actually works to drive traffic to your website. I’m also going to put away all the rumors based on some popular interpretations of Pinterest’s statements. I spend a lot of time (more than I wish I had to!) monitoring blogging communities on Facebook where people share their experience on Pinterest. I spend this much time doing it because among the numerous Facebook threads and comments sometimes I can see a pattern and it helps to figure out how Pinterest works for people in different niches, following different strategies. Also, I do it to save time for my students and to be able to provide the most recent and comprehensive information in my Pinterest SEO Traffic Secrets Course. If you don’t know what BoardBooster was, then probably you can just skip this paragraph. Before you do it, just take one thing with you: from June 2018, Pinterest is not a place to mess around using any schedulers or tools which are not shown on their official Pinterest’s partners page. Now, getting back to BoardBooster. It was one of the two most popular Pinterest schedulers for about 4 years and offered automation tools at an affordable price. Pinterest didn’t like that BoardBooster was operating without using Pinterest API. This was ok for a few years, but at some point, all big social media platforms crash upon unapproved apps or tools. Unfortunately, there was no way Pinterest would allow BoardBooster become an approved partner and the tool was closed for good. Several tools are shown on the Partner’s page but the leader is Tailwind. If you want to start using it efficiently and save yourself the time from learning it by trial and error, you could make a jump start with my very affordable video course dedicated to Tailwind. This one is quite a fundamental statement made by two Pinterest reps in an interview for Pinterest scheduler Buffer (check the video below). It’s so important because building powerful Pinterest account by reaching audiences of multiple group boards was the main strategy that has been working great for the last 2-3 years. However, it seems like from now on, Pinterest will be working on reducing the distribution of pins saved to group boards. Why Pinterest decided to do that? They said group boards became over time something different from what they were created for. Have you seen group boards with thousands of contributors? I bet you have because they are usually the ones that are too easy to be accepted to. Now, 1000-4000 contributors (the max I’ve seen, but I’m sure there are even bigger group boards) and no pinning limits can’t end up in a good way. Spam eventually takes over these boards and the board is losing the focus on one topic. As a consequence, even legit pinners on those boards get low engagement scores for their pins and a confusing keyword context based on all the spam saved to the board previously. Pinterest reps explained that group boards should be only used for collaborations on “projects”. For me, it means that group boards have to be as focused on one topic or keyword, as standard boards are. And shouldn’t involve large numbers of contributors. If you are still relatively new and don’t have many big group boards on your profile, you have two options. First, forget about group boards and work on your own boards. Second, if you still want to try to reach additional audiences with group boards, you might want to create or join only small group boards, very specifically targeted to a keyword or topic. If you already joined many large group boards, especially generic boards which allow people from all niches to pin, it’s time to evaluate how efficient these boards are for your account. Learn how I do it from this post. Since Pinterest takes distribution away from the big group boards, I can tell that you naturally will redirect the majority of your efforts to building your own boards. You might not even realize that, but a lot of established bloggers see their Pinterest traffic tanking for a while. Their accounts are packed with group boards they joined while their own boards are the minority. If this is your case, time for a change has come. Did you notice that in their Best practices, Pinterest recommends creating at least 5 boards for each topic we cover in the blog or website? By doing this, you can target several keyword variations on each board. To help your new pin succeed on Pinterest, you have to pin it to a relevant board first. Or several relevant boards. And they should be boards on your account. By saving the pin to a relevant board, you give this new image the right keyword context. 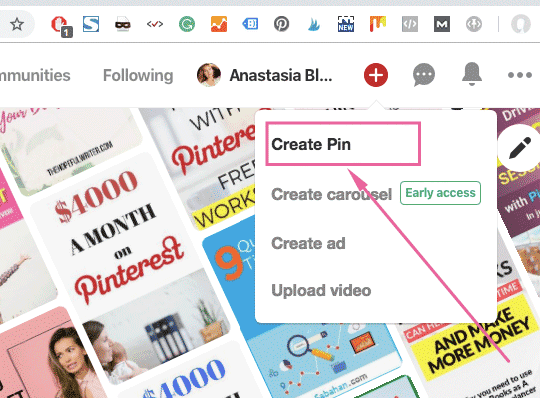 By saving first to your own board, you help Pinterest boost your pin, because they claim to give priority to the pins saved by content creators. If you’ve been on Pinterest long enough, you probably have an idea that long pins get more engagement and space in the feeds, and in general are more successful. That’s why about 2 years ago Pinterest search results were jam-packed with infographics. Some marketing sites received a great traffic influx from Pinterest in those times. I’m not too sad about it because I hated seeing those long pins using Pinterest on my phone. They used to occupy space or 3-7 normal sized pins and I didn’t find this fair. Currently, Pinterest is cutting off the long pins at 2:4.2 ratio and in general, they recommend sticking to the 2:3 ratio in the future as longer pins will not only be cut but also pessimized by the Pinterest algorithm. Several Pinterest reps talked a lot about the freshness of pins. Why would they touch on this subject? Apparently, too many bloggers were repinning their own exactly the same pins too many times to multiple boards. If you even upload the same exact image from the same exact post URL, Pinterest will recognize the image as an existent pin and in the majority of cases will immediately show you the summed up stats for that pin. The conclusion is – you need to create a lot more new pins – new image, new text overlay, new colors – anything at all has been different on the image to be considered a new pin. They started saying content creators should save new pins weekly, but I lately hear voices saying we should do it daily. Who promised Pinterest marketing is going to get easier? All platforms get more complicated algorithms over time as the competition between content creators promoting on these platforms grows. So if you are still on the fence about Pinterest traffic and think you can start later, I can’t recommend you highly enough to start working on your Pinterest account strategically NOW. The longer you wait, the harder it gets for a beginner. I recently found an additional way to make your pins more “fresh” for Pinterest while saving new pin versions for your old posts. 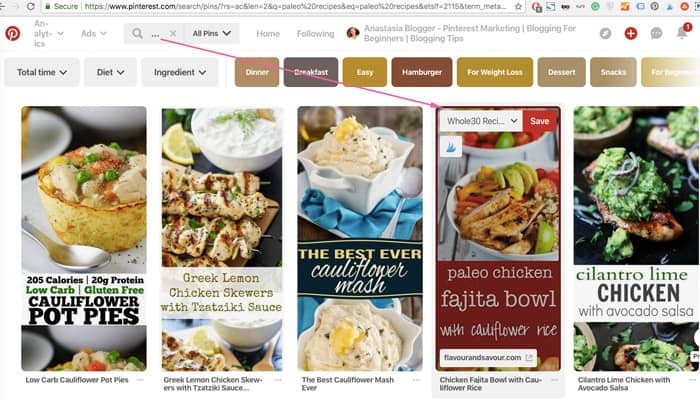 When you just save new images directly from your web pages, Pinterest Rich Pins automatically attach to them your SEO titles and SEO descriptions (if you use Article Rich Pins). This mean, all your new pins from the same page are targeting exactly the same keywords. Pinterest recommends you to create new pins and change keywords to give another perspective on your image and attract an additional audience. Changing pin description when you save a new pin does its positive job in this sense, but your SEO title and keywords in it remain the same. So what’s the new solution? Then you can upload the new image or if you saved it on the page, you can also retrieve the image from your site (insert the link to your page under the image upload). The most important part here is changing your Rich Pin’s title and description. Try to think of some new keywords you haven’t used in your SEO title for this post or page. 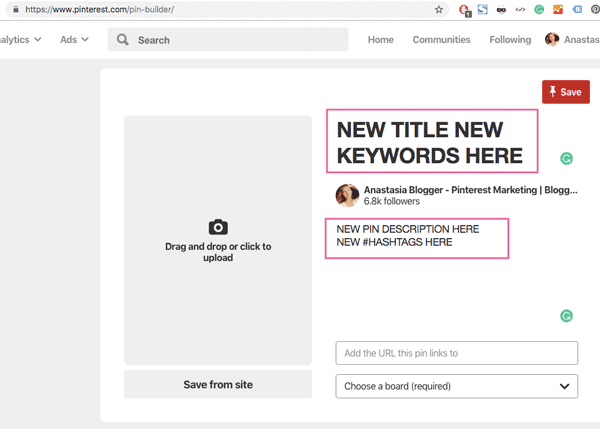 Pinterest reps confirmed what was added to their Best Practices page – you can and you should create multiple pins per post to target different keywords or audiences in each pin version. Pinterest used to have a 36-hour delay in stats shown for each specific pin. Lately, they show analytics on a pin basis almost in real time. Pinterest claims they have a 2-hour delay in reporting the data. A side note here. The stats you are seeing on a pin basis are summed up counts for all repins, impressions and saves of all versions of this pin. Imagine a user B repinned your original pin to a bigger board and that repin got a lot more impressions and clicks. This means, your own pin will be showing a summed up stats from your pin and the repin of user B Stats. Another note. When you look at the pin stats in a window like on a screenshot below don’t forget these are stats only for the last 30 days. It’s not all the repins/saves/impressions from the day the pin was initially saved. Pinterest reps mentioned on a few events that the algorithm is showing your new pins first to your follower base. The algorithm evaluates the early engagement to see if your pin should be shown to bigger audiences. This means that practices which involve mass following or purchasing followers are not helping you get traffic from your pin. In fact, they are doing the opposite. You get followers which are not going to engage with your pins. This gives negative signals to Pinterest about your content. This will limit your pins distribution. They used the term “early engagement”, which is also well-known in regards to the Instagram algorithm. If your content gets good engagement soon after publication, chances are this content might get an additional boost from the platform’s algorithm. Like most Pinterest changes, this new feature is rolled to the user base step by step. So if you don’t see the same when you try to save a pin on your desktop, probably you will see it pretty soon. The change makes saving pins it much easier. You don’t need to click on the Save button before choosing a board. Now Pinterest suggests a relevant board on your account and you can save the pin right on the same page. Not everyone was happy with this one. Because a lot of established bloggers who started on Pinterest years ago were pretty happy with their high following numbers. Since they didn’t invest as much time and efforts in Pinterest anymore, the reach often decreased a lot over time. Now their low reach became public, and it doesn’t look so great when you have a sponsored post opportunity. The reach number in your profile shows how many Pinterest users interacted with your Pins in the last 30 days. This number is rounded. Recent Pins made from your site (includes pins saved by other users from your domain). Activity tab is pretty cool – it shows you all the pins which were saved from your site. Not only saved by you (using Tailwind scheduler for example), but also by any other users. You can look at the most popular pins that get lots of saves from your site. Then make your conclusions about which pins or content works the best. You have an option to keep this tab private if you wish. I believe that by the time you are reading this post, this feature works on all Pinterest accounts. 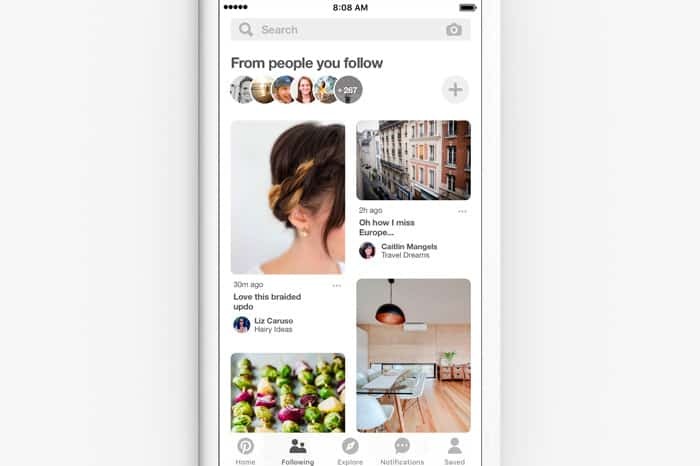 It’s the second mode of using Pinterest after the Smart Home feed – your “Following” feed. It’s a feed of pins only from the people follow and these pins are shown in chronological order. I also wrote a post earlier from which you can find out everything about Pinterest changes that happened in 2017 and earlier. 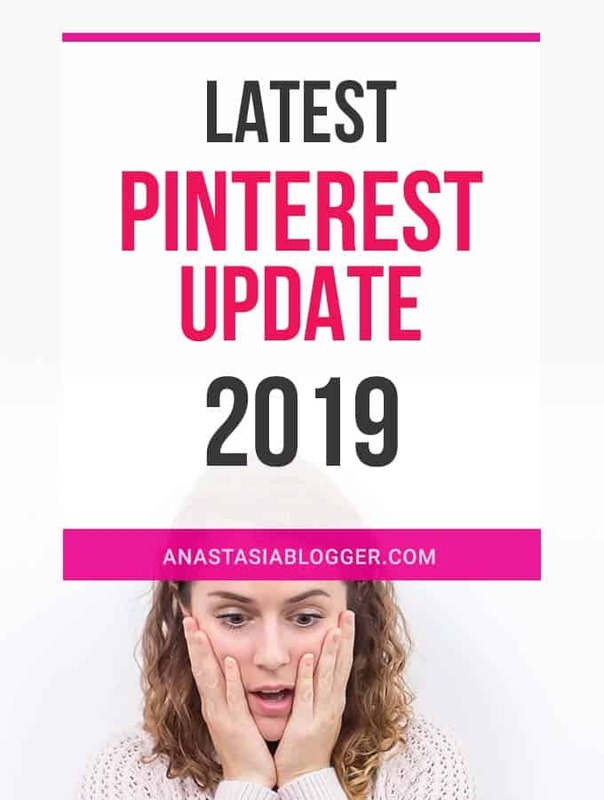 If you found this post useful, you might want to save THIS PIN below to your Pinterest Marketing board to check the post later when new updates are announced. Glad you posted this – I really like your blog. Regarding the Pinterest Analytics Glitches in July, Pinterest told me it was a glitch, but it was several random days, then BAM – all 0 from July 26th forward. My July monthly viewers went from 8.5m to 5.4m and monthly engaged from 350K to 201K because of this weird 0 glitch. Today (Aug 3rd) I no longer have 0 on those 7 random days, but I feel it still may not be accurate due to the huge disparity in the numbers. Or maybe I just don’t understand the traffic patterns. I’m trying to start a website so I want to be able to address the traffic flows in case some potential business partner asks. This article helped keep me sane to know that it wasn’t just me! Hi, Joan! I’m sorry your reach lost about 3m, summer slump isn’t easy for many bloggers. My Pinterest accounts were affected as well. Maybe you noticed in the post, the account for this blog you are reading now, was also affected by a “blocked domain” glitch. When my account was back, the majority of pins which were somewhere close to the top results for related keywords were gone from the tops. I now need to renew again most of the pins and hope the new ones will start picking up some virality. Glad the post was helpful. Pinterest traffic is great because you can get it fast and it can be quite big because of the viral effect. But we have to be prepared because Pinterest traffic is not as stable as Google SEO traffic for example. Very useful posts-thank you ! 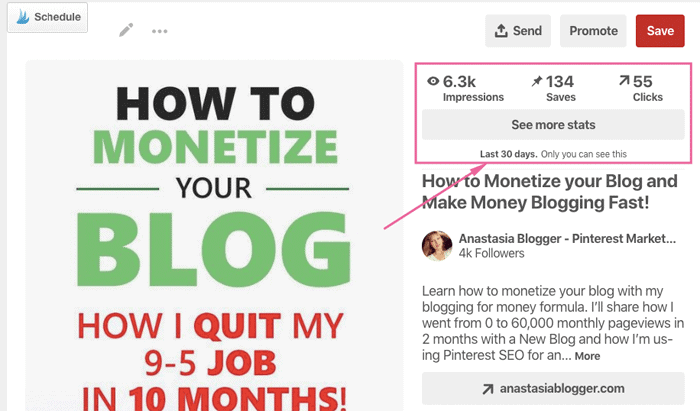 Only the last few weeks I invested a not-insignificant amount of money for a blogging course where the sole method of traffic generation is Pinterest. 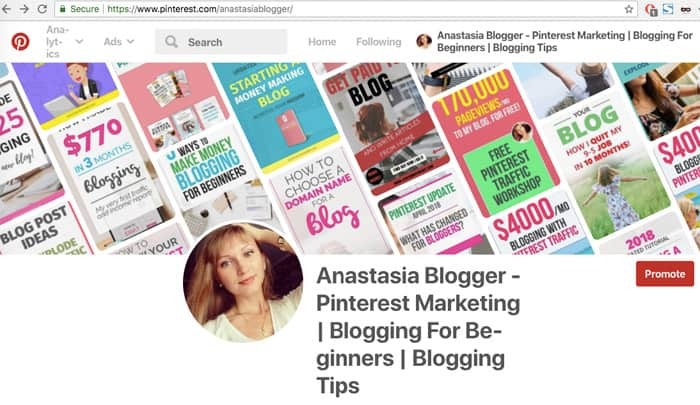 I haven’t even launched my blog yet or started the Pinterest strategy detailed in the course (it follows the same pattern most bloggers use e.g. Tailwind etc). Please check my post about 20 bloggers who gained over 25,000 sessions a month very fast using Pinterest. Please note that the majority of blogs are working in the niches which are popular on Pinterest – DIY, crafts, home decor, recipes, holidays, mom niche, gardening, bullet journaling, or sometimes all these together under one roof. Business niches are not getting as much virality on Pinterest but still, organic traffic from Pinterest will come faster than from Google if you are starting a new blog. Thank you for the update, Anastasia. Truly appreciated. Great, I’m glad it’s helpful! All of a sudden I have no blank board that says create a board. The plus sign in the upper right corner only gives me the option of creating a pin, a carousel, or ads. I only have 121 boards and haven’t pinned anywhere near the limit. I have sent the question to Pinterest but no reply yet. So any ideas of why I can’t create a new board? I have no trouble pinning things. Hi, Kimberly! Glad you find it useful! The plus sign on the upper right corner also doesn’t give me the option of creating a board. But I still have this option inside my Boards page: http://prntscr.com/mhsp5u (screenshot). So you are saying that you don’t have this option even on your Boards page? That’s very weird indeed and I hope Pinterest can fix this for you, could be some glitch. I saw some big accounts with a lot over 200 boards, like with 320 or something – so yes, you don’t seem to be anywhere close to the limit. Please keep me posted about Pinterest’s reply to you. I have a feeling they are doing some updates at the moment because this usually comes with glitches. Hashtag suggestions have not been working on a desktop computer for the last 3-4 days.